At SMX East, BuzzFeed CEO Jonah Peretti was refreshingly real about what matters in web content for his brand – and search rankings are not on the priority list. It’s a model that might not work for everybody, but when 75 percent of BuzzFeed’s traffic comes from social, he’s apt to believe that his – and other websites – should focus first on what users want to engage. For BuzzFeed, traffic and results have followed ONLY because of its user-first approach. “It’s easy to think the world operates the way YOUR network or site does,” Peretti said, admitting search may be a bigger focus area for companies that find it drives a lot of traffic. But at the same time he believes every site needs to prioritize good reads (or views). “Shouldn’t the best content appear, and it’s Google’s bad job if it doesn’t? Here are some content marketing pearls of wisdom, and peeks behind the curtain of content creation, from the human behind the web’s most shared media outlet. Brafton takes a similar approach; this content for SEO eBook is not what many marketers might expect, but instead offers actionable strategies on how to answer user queries throughout the marketing funnel…. While others may say BuzzFeed has a ‘clickbait formula’ on lock, Peretti maintains there are no silver bullets. Titles come from editorial consideration of what people would want to read. He also highlighted that anything which may be deemed clickbait has to deliver – that’s the difference between click-worthy content and spam. While others may say BuzzFeed has a ‘clickbait formula’ on lock, Peretti maintains there are no silver bullets. Any brand should be confident to share some light-hearted or accessible pieces without fearing the loss of all credibility. The top metric Buzzfeed uses to gauge success is sharing. “It’s not the only one, but we view shares as a snapshot of what people thought was ‘good enough’ to pass on,” he said. Facebook is a big traffic driver for BuzzFeed. Peretti also relishes the recent Facebook updates to wean out clickbait headlines. “I think updates at Facebook better reward niche content. Now we have opportunities to create things for really targeted audiences.” He called it a “refreshing departure” from the traditional media model where publishers are encouraged to create content that appeals to 80 percent of the population. It’s perhaps especially rewarding for brands that inherently target niche audiences. Brafton’s reported success for small publishers from similar Facebook updates in the past. Peretti considers Facebook’s anti-clickbait algorithms a “refreshing departure” from the traditional media model where publishers are encouraged to create content that appeals to 80 percent of the population. “So what do you think of Google Plus?” session moderator Danny Sullivan asked. “Can you explain it to me?” Peretti asked. Would you ever be so cavalier with your SEO approach? 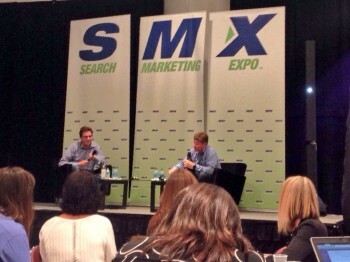 Share thoughts in the comments – and be sure to check Brafton’s full SMX event coverage.